No articles available for this journal. Managing pain in practice provides a broad range of articles for all healthcare professionals who deal with pain management. As well as specialist nurses working in an acute setting, the journal will be of particular interest to GPs and others in the community who help patients with pain control on a day-to-day basis. 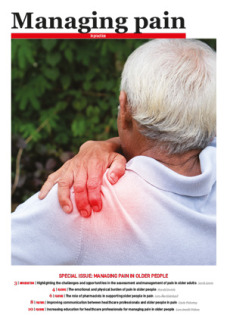 Supported by a multidisciplinary Editorial Board, and headed by a highly respected Editor and Consultant Editor, Managing pain in practice offers guidance, updates and practical advice that reflects current thinking in the field of pain management. The current issue is available free of charge as a PDF, EPUB for your iPad or smartphone, and Kindle (click here for help with loading the issue to your Kindle). You can also browse back issues to the left, or search the archive to the right. Editor: Dominic Aldington BSc MBBS FRCA FFMRCA Consultant in Pain Medicine, Pain Clinic, Royal Hampshire County Hospital, Winchester, UK. Consultant Editor: Andrew Moore MA DPhil CChem FRSC FRCA DSc Director of Research, Pain Research Unit, University of Oxford, UK. Please subscribe to access the archive. Managing pain in practice​ was previously supported by Meda Pharmaceuticals from 2010 to 2011.